As the second-least populous state, Vermont offers uncluttered vistas. With temperatures dropping and the long days of summer coming to an end, it’s time to look forward to fantastic fall getaways. Often the low season in many locales, fall’s temperate temperatures mean fewer travelers on the road and more deals for savvy travelers. Though school is back in session, 74 percent of Americans are planning to travel during the fall months, with 40 percent reporting that they will hit the road and skies and 51 percent planning to spend time with family and friends, according to American Express’ fall travel Spending & Saving Tracker. Some 37 percent are traveling domestically, and 27 percent are staying closer to home to take in the stunning fall foliage in places like Stowe, Vt., Cooperstown, N.Y., and Charleston, S.C.
Only 7 percent plan to travel internationally this fall, with Europe and the Caribbean as the most popular destinations. The Daily Meal has gathered 39 fantastic fall getaways with fall-themed packages from coast to coast, across the pond in London, and in the Caribbean. Pack your fall wardrobe (or bathing suit if you're heading somewhere tropical) and hit the road. The mountain village is known for its fall foliage from early September through late October. 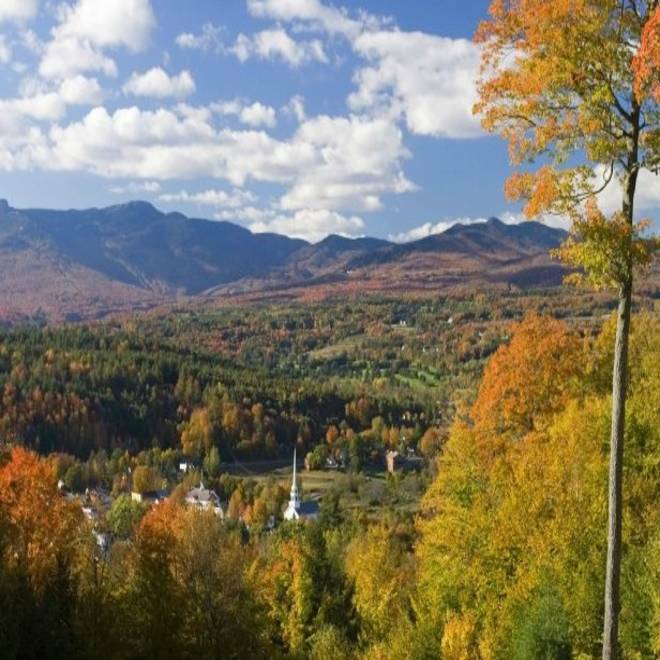 Topnotch Resort and Spa offers a Fall for Vermont bed-and-breakfast special, which includes overnight accommodations — rooms, suites and resort homes — American breakfast at Norma's, mapped foliage tours, and a Vermont souvenir. Rates start at $195. The Four Seasons Boston’s adrenaline-fueled getaway lets guests drive a Porsche Panamera while checking out the area’s fall foliage, sip a custom martini, enjoy a morning of yoga outside and enjoy breakfast in bed. Rates start at $550; available on weekends, starting Sept. 29. Beer connoisseurs can raise a pint or two at Brasada Ranch’s Lompoc & 10 Barrel Beer dinner on Oct. 27. Brewmasters Bryan Keilty of Lompoc Brewing and Tonya Cornett of 10 Barrel Brewing Co., craft breweries in Bend and Portland, respectively, are pairing their Oregon beers with a four-course meal prepared by Brasada Ranch’s chef Adrian Carpenter. The $65 dinner at Range Restaurant and Bar at Brasada Ranch, a member of Preferred Hotels & Resorts, includes albacore tuna ceviche with sweet corn sorbet, pickled chanterelles, and aji panca chile gastrique; baby spinach and duck confit salad with soft-cooked farm eggs, roasted red peppers, black currants, and warm pancetta vinaigrette; wood-fired beef rib-eye with olive oil crushed heirloom potatoes and roasted romanesco with bourbon whole-grain jus; and Juniper Grove goat cheesecake with caramel, hazelnut sandies, and farm-fresh berries. Rates: $199 per night; does not include the Lompoc & 10 Barrel Beer dinner. Tour Yellowstone National Park and Grand Teton National Park with The Clear Creek Group’s Yellowstone and Grand Teton National Park Autumn Adventures package, which includes a stay at Shooting Star Cabins and a Western picnic made with locally sourced ingredients from Wyoming that can be enjoyed while overlooking the Tetons. Golfers can play alongside touring pros with the annual GolFantasy, from Dec. 2 to 9, at the 700-acre Casa de Campo, which has three golf courses. During the week, guests play 18 holes with touring pros each day in groups of four and five. Other events during the week include clinics, tournaments, forums, individual instruction and daily contests. The package includes accommodations; round-trip transfers to and from the airport; all private GolFantasy activities including golfing and other interaction with Pros, plus instruction, unlimited golf, including cart and greens fees; three meals per day at on-site restaurants including Chinois and Beach Club by Le Cirque and all beverages including alcoholic beverages; and a goodie bag for all. Rate: $3,295 for the four-night program and $4,995 for the 7-night program. We want to see your travel photos! Submit your most colorful shots below and we will publish a selection in a future post.